After cranking 67 home runs over the past two years, Dylan Cozens ended the month of April with three in 2018. On Wednesday, he doubled that total and made history in the process. Philadelphia's No. 17 prospect powered his way to the first three-homer game in Triple-A IronPigs history and drove in four runs as Lehigh Valley rallied to take down Syracuse, 8-6. Cozens got his power binge started shortly after first pitch at 10:35 a.m. ET. With the IronPigs trailing, 5-0, going to the bottom of the second, the outfielder belted a solo homer to left field with one out off No. 4 Nationals prospect Erick Fedde. Joey Meneses immediately followed with his first long ball of the year, also to left. In the third, Cozens took Fedde deep again, capping at three-run inning with a two-run shot to right-center that leveled the score at 5-5. After the Chiefs broke the deadlock on an RBI single to center by Spencer Kieboom in the eighth, the IronPigs stormed back with Cozens sparking his team again. Following consecutive outs to lead off the inning, the 23-year-old hammered his third shot of the day to right-center to draw Lehigh Valley even. Meneses followed with a single and Andrew Pullin's two-run homer to right put the home team in front for good. Cozens' three-homer showing was the second of his career and his first since Aug. 3, 2016 with Double-A Reading against Bowie. It was his second multi-homer game of the season after cranking a pair on April 13. "I normally start every year slow," Cozens told The Morning Call. "To be where I'm at feels great. ... I think I'm going to have a big year." During the 2016 season, Cozens put himself on the prospect map with 40 homers for the Fightin Phils, capturing the Joe Bauman Home Run Award as the Minors' leader. Along with his record power season, Cozens batted .276/.350/.591 with a Minor League-best 125 RBIs, but in his first Triple-A season last year, Cozens' offensive numbers tailed off. While he clubbed 27 homers, the Scottsdale, Arizona native batted just .210/.301/.418 in 125 games. 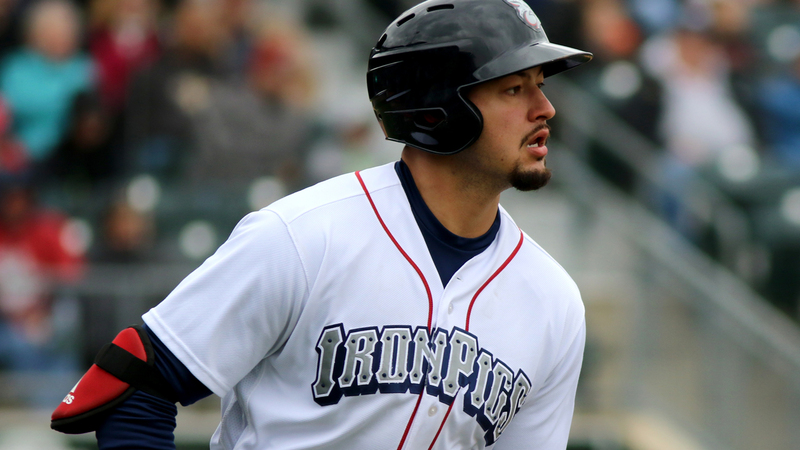 Cozens is adjusting better in his second tour through the International League. Wednesday's performance lifted his 2018 line to .278/.385/.557 and extended his modest hitting streak to six games. Fedde avoided the loss for Syracuse but was tagged for five runs on eight hits over five innings, matching his season run total entering the game.